Melt butter in heavy large saucepan add olive oil over medium heat. Add leeks; stir to coat with butter. 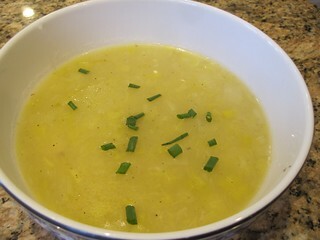 Cover saucepan; cook until leeks are tender, stirring often, about 10 minutes. Add potatoes. Cover and cook until potatoes begin to soften but do not brown, stirring often, about 10 minutes. Add stock. Bring to boil. Reduce heat, cover and simmer until vegetables are very tender, about 30 minutes. Just made the soup. Mmmmmmm good!